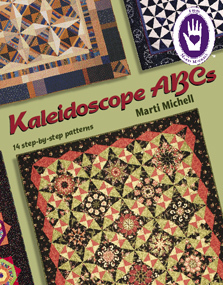 Marti Michell's book Kaleidoscope ABCs includes plenty of tips & tricks, detailed instructions for cutting with the small and large Kaleido-Rulers, full-size patterns, and how-to's for making over 14 quilts in a variety of styles; including the smashing cover quilt "Ramblin' Rose with Guacamole and Extra Salsa on the Side." Also includes a diamond border to use on any quilt, previewing patterns with mirrors, what size is a quilt?, tips on planning Kaleidoscope quilts, using a design wall, getting a good seam allowance, adding a flap border and mitered borders. As well as a dozen additional cutting tips, like cutting half-Kaleido-Angles, precision cutting multiple and single layers and breaking into the border.